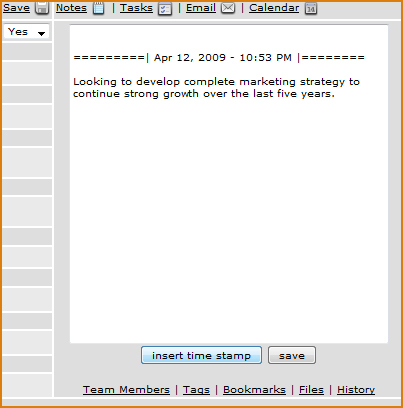 After saving, it may be useful to add some basic notes about the project in the Notes area. Notes can be anything from details about the opportunity itself to source and contact details. 1. Type in the note below (or your own note) in the Notes area. 2. 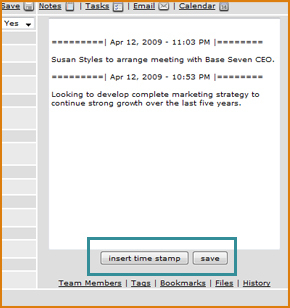 Click INSERT TIME STAMP to insert the current date and time. This will be needed to keep track of your notes. 3. Next, click SAVE under the Notes section. Note: Clicking Save in the middle bar of the opportunities will save any changes made to the project, but not the notes. Always make sure to click the correct SAVE button. 4. To insert a new note, you will want to add it above the latest entry. This is because time stamps are always added at the top of the notes section. Put your mouse cursor above the first entry and click. 5. Now type in the new note, click INSERT TIME STAMP and then SAVE.